Hello Decembert! You know what that means? Time to open your 1st advent calendar package! This is going to be a new tradition in our home and I could not be more excited! Having a toddler just makes the holiday that much more special for us. 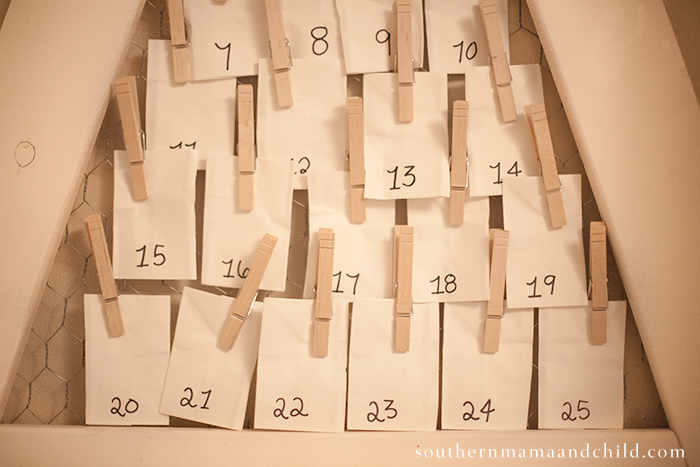 Today, I am sharing an easy DIY farm house style Advent Calendar! When thinking of a design I wanted it to be in the shape of a tree, something that went well with out furniture and decor, and could last for years to come. The chicken wire really adds that country cottage feel. 1. 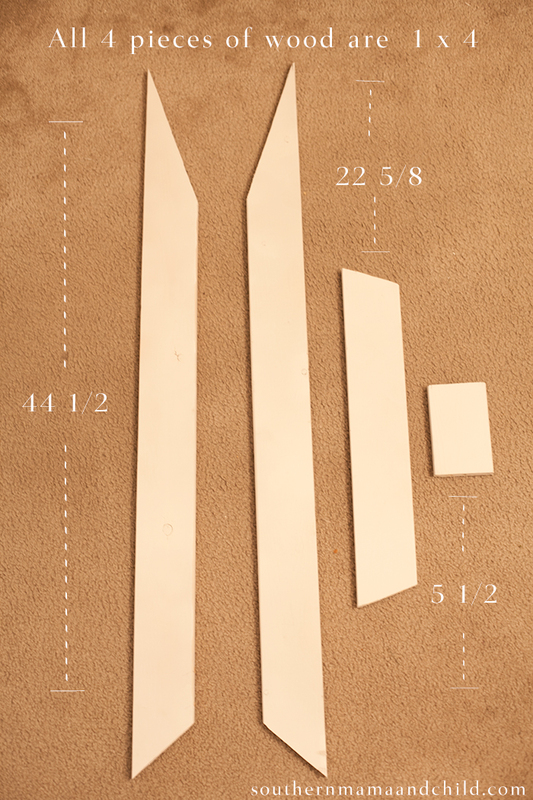 Cut each 1″x4″x4′ board to its respective length as shown above (two at 44.5″ and one at 22 5/8″, although cutting at an even 45″ and 23″ would be within the margin of error and still amount to the same final product). – Side note, you can adjust the width and height of your tree as well as the corresponding angles, you may just have to use some trigonometry! 2. On the two 44.5″ pieces, using one corner as the pivot point with the right angle mark a line at 15 degrees and cut using the skill saw. One the same 2 pieces, mark a 60 degree angle line and cut using the same side of the wood for the pivot point and so each piece is a mirror image of the other as shown above. 3. On the 22 5/8″ piece, use the same pivot point on each side, mark a line at 75 degrees, and cut so that the piece looks like a trapezoid as shown above. 4. The last cut can be done on the same 1″x4″x4′ board that the 22 5/8″ side was taken from and simply cut at a right angle at 5 1/2″. 5. Spray paint the top surface and all sides of each piece and allow to dry. 6. Using the 1/4″ drill, drill pilot holes for pegs to be placed at each junction between two pieces. Ideally the pegs should be placed horizontal to the ground for maximal support against gravity, except the trunk pegs will have to be vertical to the ground obviously. Use at least 2 pegs at each junction (8 total) in order to decrease any rotational strain. (Hint, when drilling the pilot holes, place a peg in the first hole and use a pencil to mark the end of the peg, align the board with the peg next to the corresponding other board for that junction, mark the exact location the peg should go on the corresponding board by pushing the two boards together thus leaving a mark, and finally double check the trajectory of the peg and then drill the second hole) (We chose this method but nails or screws can certainly be used. Just be careful not to split the wood). 7. Put wood glue into each hole and place the pegs. 9. 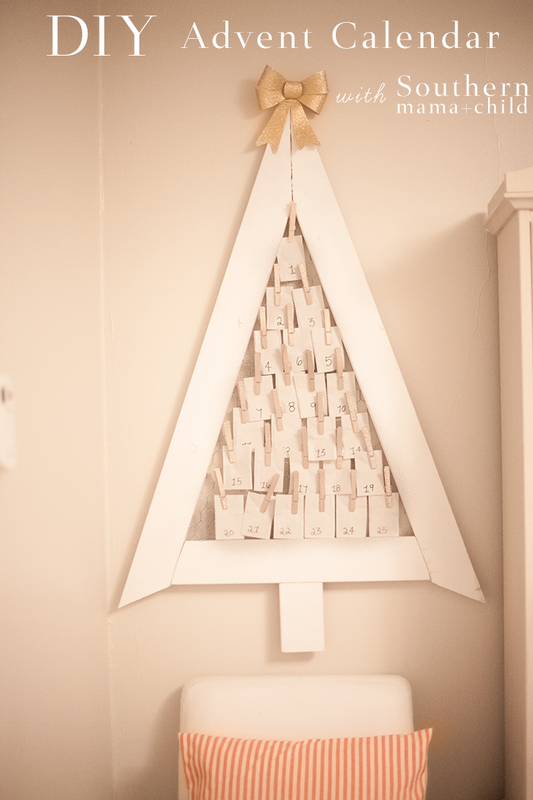 Flip the tree over, cut approximately 30″ of chicken wire and use a staple gun to attach it to the back of the tree. Cut any excess chicken wire off after stapling. 9. Write down your scriptures and add your trinkets for each day in your sack. 10. Clip on sacks with pins, and you are done! Ideas for each day by Eloise & Me! So thankful that this lady shared her inspiration for scripture and trinkets each day! This inspiration is especially great for those with toddlers! Thanks Blakely! Dec. 2 – Matthew 1:18 (ring, or ring pop) talking about engaged, Joseph & Mary.